The atrium is used as central waiting and refreshments area from which guests go on to enjoy the salt healing therapy rooms, dining room and seminar room with stunning views of Lake Attersee. The SOLARDOME® PRO double glazed skylight provides optimum light transmission and heat retention over the atrium resulting in a light and airy space. The SOLARDOME® PRO system is the latest development for Solardome Industries and offers an impressive design alternative to traditional buildings. The patent pending dome aluminium system enables the design and manufacture of bespoke domes up to 25m diameter, quickly and cost-effectively. Solardome Industries is also partnering with Diana to create a bespoke dome home. 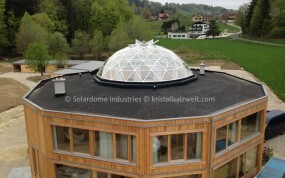 The private house, next door to the Kristall Salz Welt facility, is a 10m SOLARDOME® PRO geodesic dome, with 2 thirds glass panels and 1 third traditional wood panels. Complete with a mezzanine level, wood burning stove and all the services and amenities needed, this modern and unique home is due to be completed in 2014. Please email us at sales@solardome.co.uk or call us on +44(0)23 8066 7890 and we’d be delighted to tell you more about the project.